Frodo Baggins might be smiling because he’s about to permanently visit the Grey Havens, but he could just as well be wistfully smiling about this mushroom-stuffed meatloaf. I’ve been a fan of Elijah Wood since he debuted in Back to the Future Part II (1989), playing a rather snotty kid picking on Marty McFly. I’m glad he hasn’t ended up typecast as a hobbit, however, and he’s had quite a variety of roles. I think his creepiest was definitely in Sin City. But, I was thinking that he has definitely been typecast as the troubled young man who has a faithful sidekick—first there was Wilfred and recently there was Dirk Gently’s Holistic Detective Agency… Hold on—everything IS connected! What’s your favorite Elijah Wood role? In a large skillet, melt the butter over high heat. Add the mushrooms and sauté 5 minutes. Add the cognac and cook over fairly high heat until most of the liquid evaporates, about 5-10 minutes. Add the “Shire” Seasoning; combine and set aside. Preheat oven to 375°. Coat an 8½” by 4½” glass loaf pan with cooking spray. In a large bowl, combine the remaining ingredients with your hands until thoroughly mixed. Gently mix in the mushrooms. Put in the loaf pan and press down. Smooth top and bake 1 hour, or until a meat thermometer registers 160-165° in the center. Let stand 10 minutes before slicing. Cover and refrigerate leftovers. Serves 6-8. 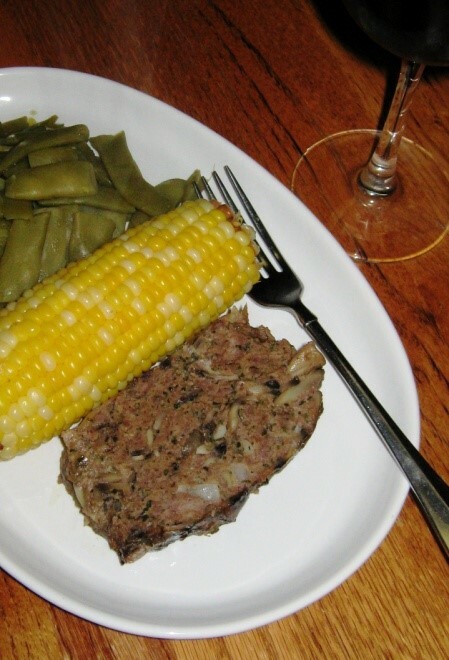 This is known as “Mellow Mushroom Meatloaf” in my cookbook.